I have known for a long time that war is gruesome. I made that connection when I was only nine years old and this picture taken by photojournalist Nick Ut was published. Here was another nine year old girl from the other side of the world. She effected me profoundly. It frightened me then and even now makes me little nauseous. 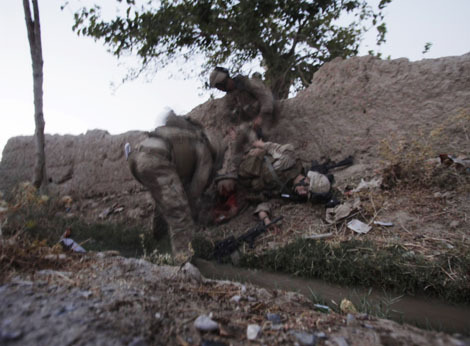 Perhaps we have forgotten that war is a messy place where people get maimed and killed. Maybe out of respect for this girl’s family, for her own dignity our media should have suppressed this picture. Certainly Robert McNamara would have appreciated a little space to do his job without being hounded by liberal humanists that didn’t have the heart to recognize that when you make an omelette you have to crack a few eggs. Robert Gates is not very happy about the publishing of this photo which was taken by Julie Jacobson, an embedded photojournalist in Afghanistan. He publicized his criticism of the Associated Press which included this sharp retort. “Your lack of compassion and common sense in choosing to put this image of their maimed and stricken child on the front page of multiple American newspapers is appalling,” Gates said. My heart goes out to this boy’s father, his family, his friends. 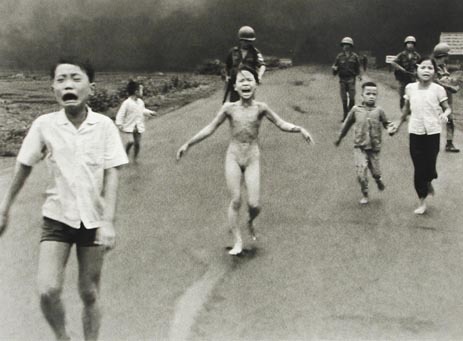 I have never forgotten that little girl or the image that helped shape my political perspective. We do not have to be a brutal species. When I was in Boy Scouts during those screwed up times, many of the older boys volunteered to go to Nam when they came of age. It was expected. Since the troop was sponsored by our church, it also took on the mantle of a holy war. This was a war against those godless Communists, after all. A strange juxtaposition between Jesus loves you and Better Dead then Red. I particularly remember a kid from my neighborhood that became an Eagle Scout, (which is quite an achievement) who enlisted in the Marines when he turned eighteen. His father was a scout leader who trumpeted the virtues of fighting Communists, during our troop meetings. That poor kid never saw nineteen. His father gave up scouting, His boisterous patriotism was replaced by what I can only describe as a slow fade. He aged twenty years in one. So my take on war, religion, and patriotism were shaped by the time I was twelve. When I see pictures of the casualties of our current war, I am torn between the effect on the soldiers family and the public right to bear witness to the decisions our government makes on our behalf. I have heard the chest beating, and have seen the grief. A soldier doesn’t get a choice to question his government, but I do,and I have. Mr. Gates is partially correct. The picture is appalling and it does cause more anguish. It is politically damaging, but hiding it hides the truth. Thank you, Crabby, for sharing an experience that helped shape your perspective. There is much in both her commentary and her images to nurture thoughtful discussion. I have a strong recollection, Zhak, of seeing that little girl running down the street during the morning news on the television set in the kitchen in Poughkeepsie. I remember, later seeing that picture, and realizing for the first time that she was naked. When I saw the film footage (that “photo” is actually just a frame from film, I believe) the first time, all I remembered was the fear on her face. President Bush tried to prevent photos of flag-draped caskets from Baghdad during his time. President Obama wants to prevent photos from Afghanistan. When it’s “your” war, you want it to be politically popular. These photos don’t help. However, I think the photo was helpful for the rest of us because, you are right. The clean-cut returning soldiers we see on leave, or after their duty is over are not the ones we don’t see. The returning soldiers saw that and are to be admired for enduring what must be an incredibly stressful situation all around, including seeing this sort of thing on a regular basis. They really are heroes. But the rest of us need to be reminded that some of these kids, who aren’t a whole lot older than our kids, are out there dying horrific deaths. My alcoholic grandfather, who had worked in the Army Corps of Engineers in his 20s, returned to duty in his late 30s as a buck private, driven by the patriotism that the Japanese attack on Pearl Harbor created in him. He wrote letters home to my grandmother about how kids not much older than his were getting slaughtered all around him. He was a drunk when he left to go there. He was a complete mess when he returned. He died in his mid-40s from liver failure. I too feel for this boy’s family. But as an American, I don’t want any war sanitized. Because as I go from my air conditioned house to my air conditioned car to my air conditioned office, eating too much food and exercising too little, and spending too much time on the Internet and not enough time with my family or sometimes keeping up my end on chores around the house, I need to be reminded of what these kids are going through in order for me to enjoy this sort of mindless, carefree existence. You know what I first noticed about the picture of Lance Cpl. Bernard is the actions of his companions. Under fire in uncertain circumstance that are coming to the aid of their horribly wounded brother in arms. Yes, as much as I oppose the deployment of the military in almost every circumstance, these young men are too be appreciated and applauded. And I also don’t wish for any war to be sanitized. A mother of young children may want to guide and guard them from the more gruesome images. But for the older children, the teenagers who may be entrusting the wholeness of their bodies and minds to the political ‘deciders’, they should know clearly what they are facing before they sign on the dotted line. Thank you for the kind words Tony and excuse me for editing out your spam link. I’m a vegetarian. I hope you do, Kelli, although you picked a most distressing post to call ‘really nice.’ I hope you don’t mind that I stripped out the link to your wiki page and identifying information.